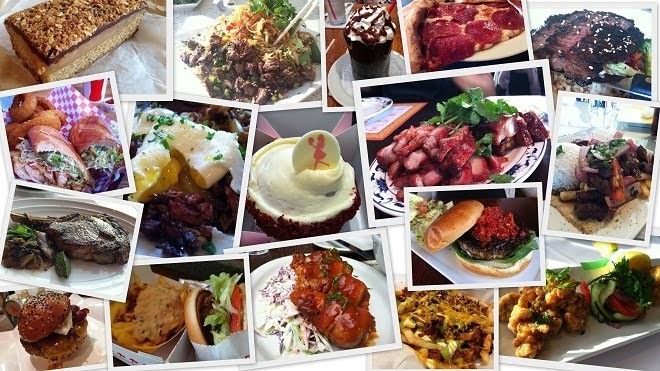 A couple of weekends ago, I was reading Kirbie Cravings' review on Bushfire Kitchen and I immediately texted my good friend and Carlsbad resident, asking her if she has been. She told me that it is always busy (that's a good sign). That evening.... I received an invitation to visit Bushfire Kitchen! What a coincidence! I was ecstatic. 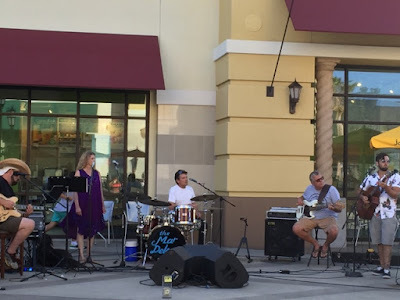 My husband, M, and I made it a 'date night' this past Sunday and drove up to La Costa for an early dinner. 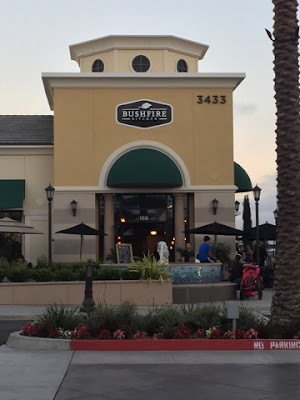 Bushfire Kitchen is located in the La Costa Town Square shopping center in Carlsbad, next to Vons and Jamba Juice. It is quaint and very cute inside. They have outdoor seating in the patio, as well. The kitchen is located in the front for everyone to see. I did not get close enough to take photos of the "cafeteria style" display. Here's the process... as you wait in line, you can glance to see the hot entrees and sides, and cold side offerings they have behind the glass display. There are menus posted in front of you to guide you in your decision-making towards the awesome meal you are about to order and receive. You order your food, pay at the register and they give you a number. Eddie, the Bushfire Kitchen manager, sat M and I on the outside patio to enjoy the band playing outside. He gave us a warm greeting and started talking about Bushfire Kitchen's history. The Barwin cousins (Clive and Brandon), are the owners of the Bushfire Kitchen and Bushfire Grill (Temecula location). They are from South Africa and Australia and they bring local, fresh, and organic ingredients to their restaurants, along with flavor influences from where they grew up. Eddie informed us that everything is made from scratch. He mentioned that when guests ask him, "What is good here?" he responds with "If you do it well, everything is good." I LOVE that.... and he was right. Right of the bat, I could tell that Eddie has a passion for food and what he does. Kaleslaw. I absolutely love coleslaw because of the acidity and crunch. 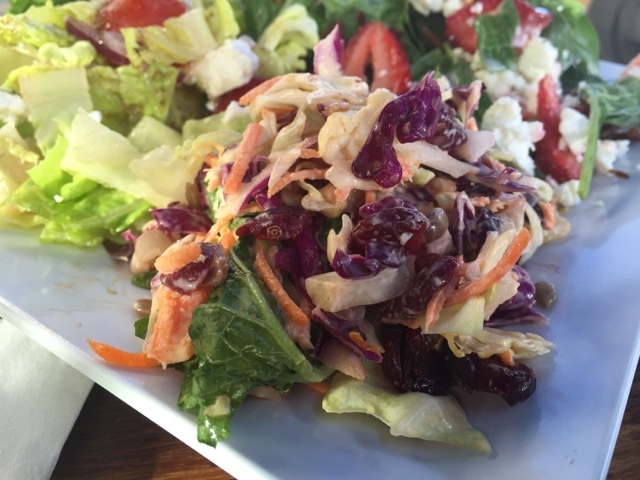 In addition to the normal coleslaw ingredients of shredded cabbage (green and purple) and shredded carrots, it came with kale and sweet cranberries. The bitterness of the kale and the sweetness of the cranberries really went well together. Spinach & Strawberry Salad. This one was one of my favorites! 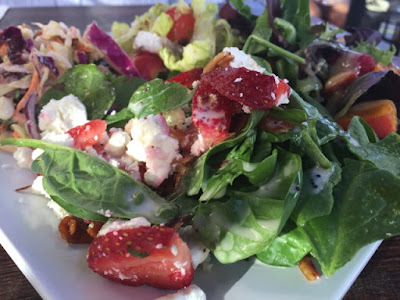 It came with crisp spinach leaves, walnuts, strawberries, and goat cheese -- all dressed in a poppy seed dressing. I loved the creaminess and tang of the goat cheese with the strawberries. So good. I realized I was eating this one a lot and remembered I had to try the other salads too. Mixed Seasonal Green Salad with their house vinaigrette. 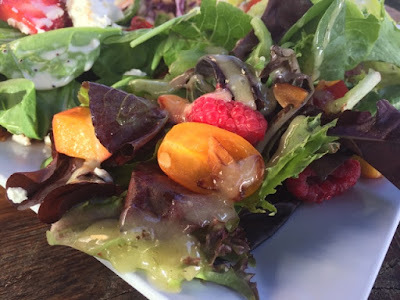 This salad consists of mixed greens, raspberries, cherry tomatoes, peaches and almonds. I loved the addition of the summer fruits, especially the sweet, juicy peaches. Rustic Greek Salad. This Greek salad was the simpliest of the four and I loved it. 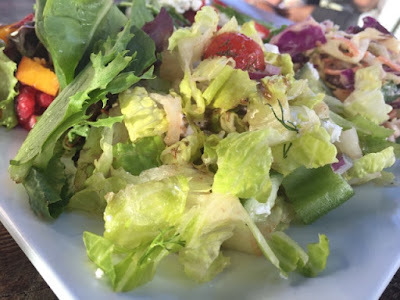 It was the combination of the crunch of the romaine lettuce, the flavor of Greek seasoning and tangy dressing, the crumbly feta cheese, crisp cucumber and diced red onions that I enjoyed altogether. 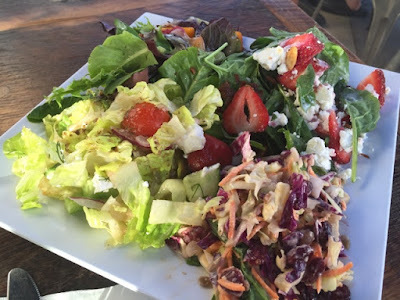 I would order this salad again in a heartbeat. As we devoured the salads, we were brought our beverages. 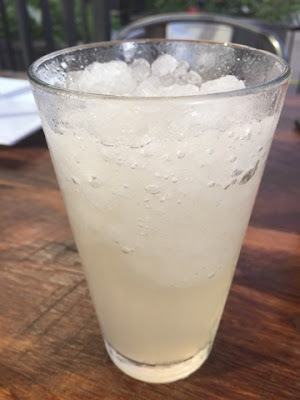 M asked about their natural sodas and Eddie suggested their ginger soda. A sip of the ginger soda definitely gave you good "punch" of ginger flavor to start off with, but finishes with a nice hint of sweetness. M enjoyed it. I asked Eddie about their strawberry basil lemonade I have read about, but they had a different type of lemonade available: strawberry cucumber lemonade. Yum! 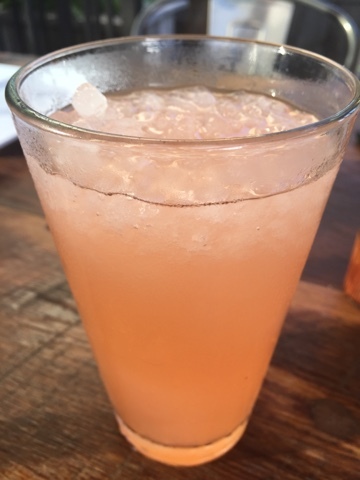 Think 'spa water meets strawberry lemonade'. It was sweet, but it was not overly sweet like most lemonades. It was refreshing on this warm Sunday. Then, suddenly, here come the plates. Yes, plural. PLATES. Yay! Natural Angus Tri-Tip ($13.95). The tri-tip is one of the entrees Bushfire offers. 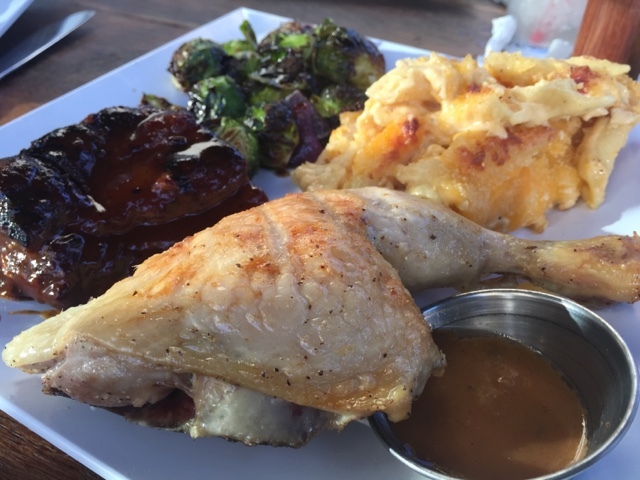 You get a choice of two sides with this entree, in which they served us garlic mashed potatoes and seasonal grilled vegetables. These two sides were what I would EXACTLY order with the tri-tip. Great choices, team! 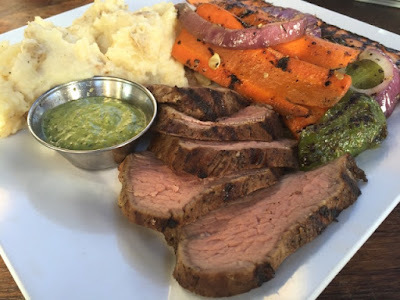 The tri-tip was served with their recommended chimichurri sauce. The meat was so flavorful and tender. When the meat was paired with the chimichurri, it added a little kick and extra flavor. 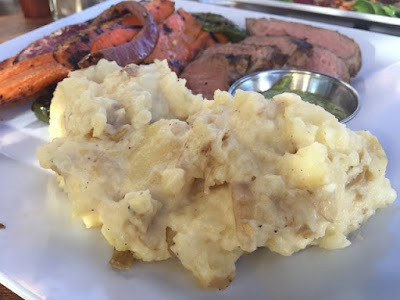 The garlic mashed potatoes had a subtle hint of roasted garlic. It was delicious and simple. It is a perfect side with the tri-tip. The grilled vegetables added freshness to the plate. 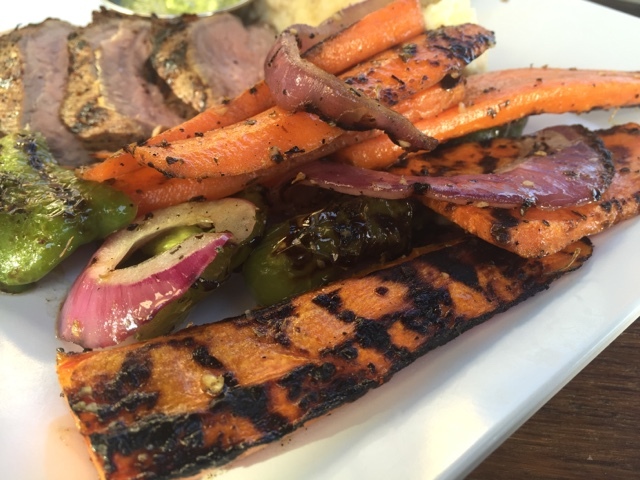 We loved the char of the vegetables, as it reminded me of enjoying a meal at a summer backyard BBQ. 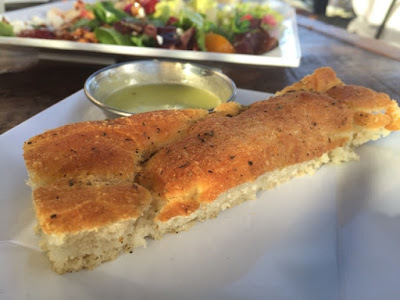 M and I were each given a warm, house made piece of foccacia bread with a cilantro sauce. The texture of the bread was light and airy. The sauce had a sharp flavor of cilantro. M ended up dipping everything in this sauce, like the tri-tip, roasted chicken and the vegetables. The next entree we received was Mary's Free Range Chicken and Ribs Combo ($13.95). They served us Grandma's Mac + Cheese and Roasted Brussel Sprouts for our two sides. Eddie mentioned that Bushfire is known for their 'Peri Peri' sauce, paired with their chicken. It is as if Eddie read my mind.... he gave us dark meat! I cut into the roasted chicken leg and it was so juicy. 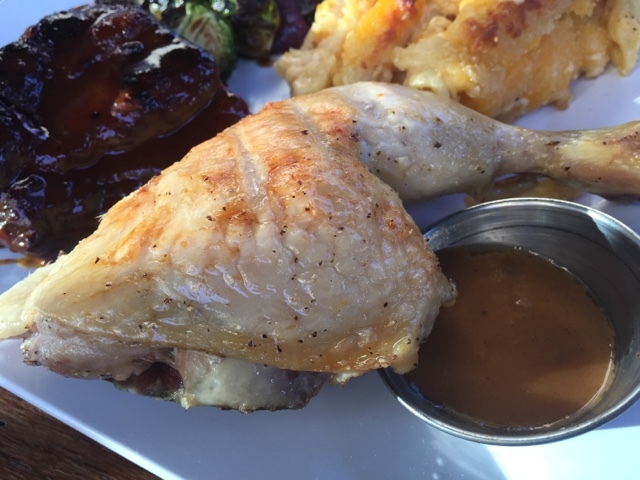 The flavor of the chicken alone was wonderful, perfectly cooked and seasoned. The Peri Peri sauce is a spicy chili sauce. The chili is harvested in regions of Africa. The sauce was a bit spicy for me, but the flavor was really good. The quarter rack of baby back ribs were slathered in their homemade BBQ sauce, which had a great, smoky flavor. 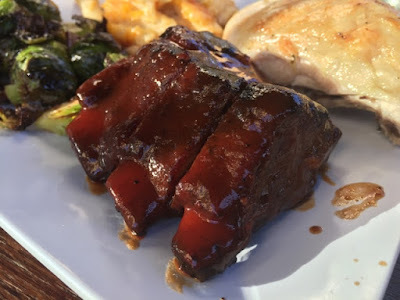 The ribs were not as tender as I would have liked them to be, but they were still very delicious. Cheesy goodness. Yes. 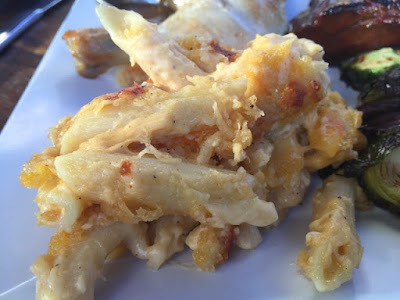 Grandma's Mac n' Cheese was the perfect side dish with the chicken and ribs. It was comforting, warm and cheesy. It had little bits of crusty cheese on top. I love brussel sprouts! When they are roasted, especially like these, they are absolutely wonderful in flavor. 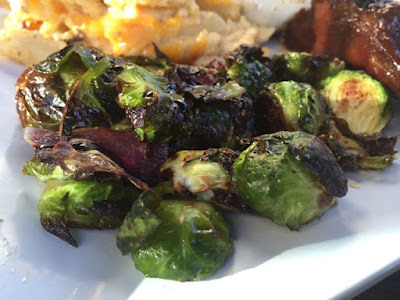 If you have never had brussel sprouts before, think mini cabbages. They are not as bad as you think. I loved the charred sprout leaves! They are a little bitter, but I love the flavor. It goes well with the richness of other dishes on this plate. 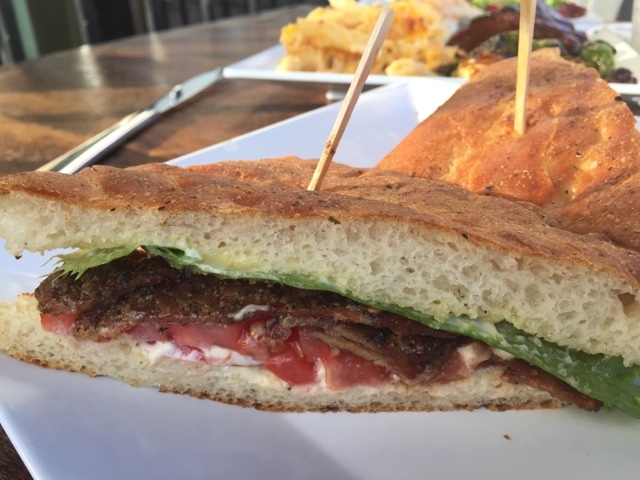 Eddie raved about the Millionaire BLT ($8.95) on their homemade foccacia bread. Their bacon packed a spicy punch! He said that it has red hot chili peppers on it. I really enjoyed eating this sandwich. Plus, the mayo is made in-house too! I would order this again with their homemade potato chips and mixed green salad. Yum! 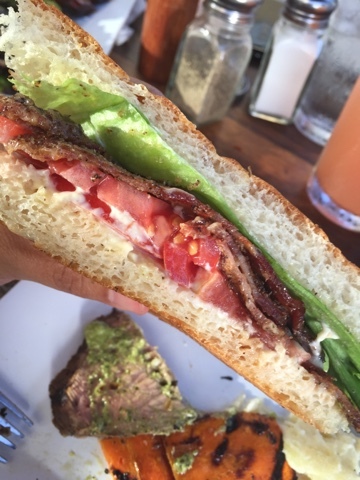 Here is a closer look of the delicious BLT. 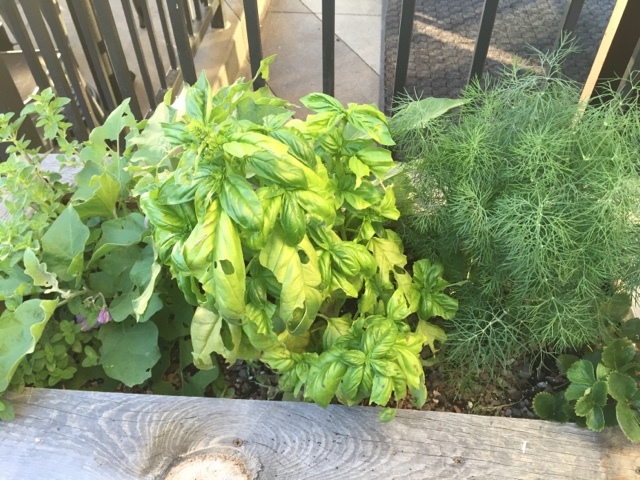 We noticed that they had a little herb garden in the patio. I spy fresh basil and dill. I already crave everything that we ate here. 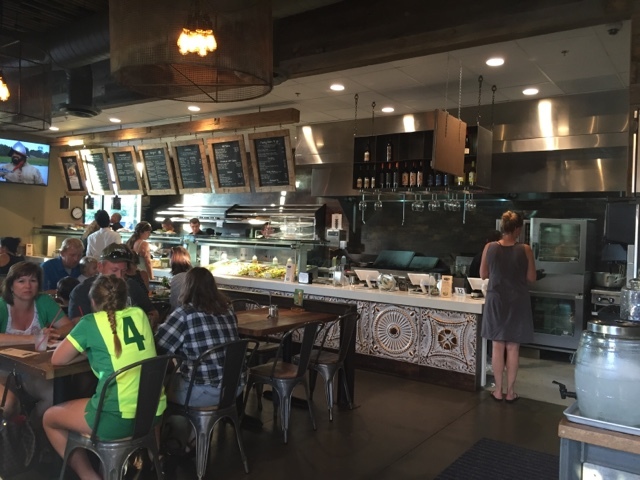 We will definitely make occasional trips to Carlsbad to eat at Bushfire Kitchen. We highly recommend it! 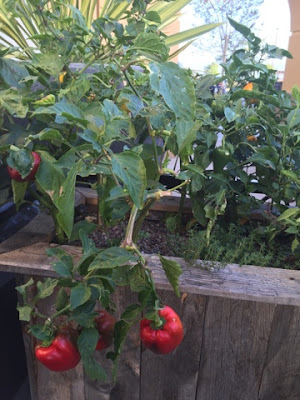 **Disclaimer: I was invited by a PR company to visit Bushfire Kitchen. I was not compensated for writing this post and all opinions and views are my own. Thanks!